Jana: Tell us a little about yourself and how you came to start Helay scarves? Malalay: My name is Malalay Tahir and I'm 19 years old. I was born and brought up in London, the heart of fashion. 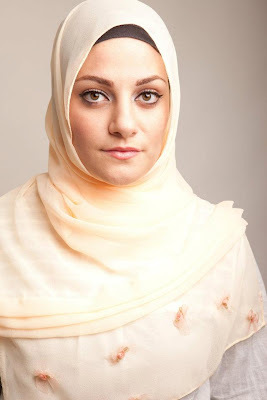 I belong to a Muslim family, however was the first one to wear hijab. There were some objections, but Alhamdulillah for me it has been a wonderful five years. I always had a dream of bringing about a fashion revolution; at school I excelled in Design & Textiles and held an extreme passion for it. I would be sitting in my Chemistry class and would secretly be sketching for my Textiles coursework instead of working out chemical bonds. However, since I started wearing hijab there didn’t seem to be much choice available for hijabis. Therefore it is time for change and to illustrate that hijab can go hand in hand with modern fashion. 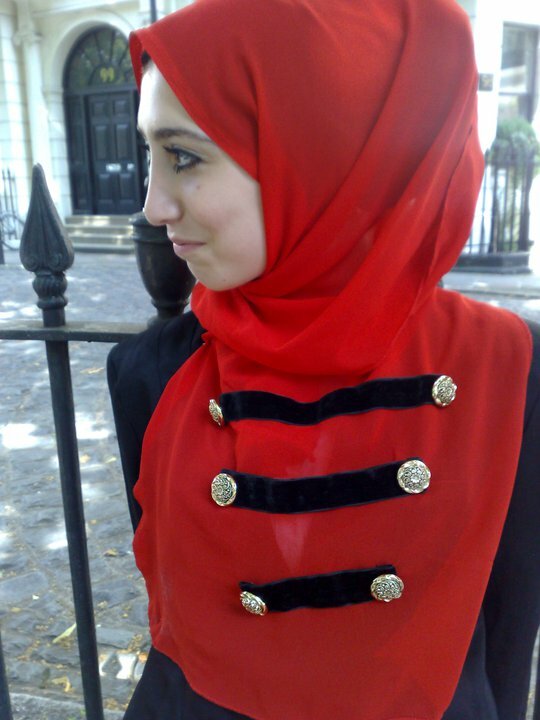 We can dress with style and grace whilst still in keeping with the Islamic concept of hijab. That is why we not only concentrate on keeping our designs stylish and fashionable but also large enough to cover generously and to be styled however the client wishes to. Jana: What people/places/things inspire your designs? Malalay: Anything and everything inspires me! From Military Jackets to Pearl necklaces, I take into account different fashion styles that are up-to-date and try and implement them into my scarves. My overall aim is to design pieces that are one-off designs yet ensuring they are elegant, chic and for the modern day Muslim woman. There are plenty of stores out there that sell scarves, but at Helay we give you something completely special and unique. Jana: What are your personal favourite pieces from your collection? 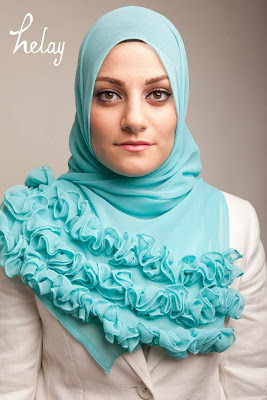 Malalay: My favourites would have to be the Pearl’a scarf in black and Blossom in pastel blue. The pleats and pearls add incredible charm and grace to an outfit. Another favourite would be the Military Scarf, its striking red colour combined with the soft black velvet and gold buttons state a true fashion revolution. The first time I wore it was to an Eid dinner with black wide leg palazzo trousers and a black blazer. I had at least 20 people coming to me asking where I got it from! Jana: And how can we order your scarves? Malalay: Helay designs to serve internationally and cater to customers who may prefer a certain design in a different colour to match their outfit. If you order from us after reading from this feature you will receive a 30% discount, when quoting the code hijabstyle (valid until 10th February 2012). At the moment our website is under construction, but in the mean time please continue to make your purchase by visiting our Facebook page where you can view our whole collection so far and order via email. Otherwise you may contact us through Twitter or our blog. The Helay Team is really grateful for all the support and appreciation we have received recently. We will soon be launching our next collection so do keep up with updates via Facebook, since we have some extremely exciting designs coming up! WOw! Gorgeous Mashallah. WHen she said unique she wasn't kidding. I love learning about new passionate business starters. Thanks for such a great interview!